The Real Estate or Rental Property Management website application software is an integrated solution for companies that manage rental properties or properties for sale, and are looking to display and provide details about these properties on their website. 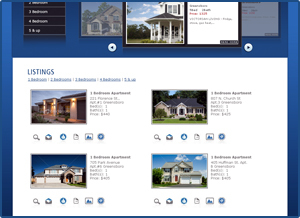 In creating the Real Estate Management / Rental Property Management website application software, our designers have focused on a user experience that is clear and intuitive, with a user interface that is visually appealing. Our engineers have optimized the product for speed and reliability, and work to continually improve responsiveness. With these key elements in place, we’ve created an application that delivers accurate, up-to-date listing results so that consumers are quickly engaged and encouraged to stay on the website. 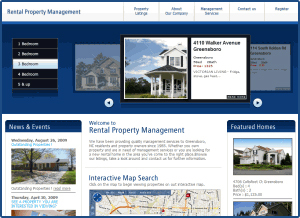 The Rental Property Management website application software is easily controlled by managers who have the ability to create and modify rental properties on their web site using an efficient and powerful administrative tool that is simple to use and allows for instantaneous updates to the website. The Real Estate Website Management application allows for easy updates of rental properties with multiple features such as image upload, category management, listing management, news and events management, and much more. The application consists of a visually appealing and user-friendly website, where properties are displayed and featured properties suitably showcased, to capture the attention of the website visitor. The website has several other user-oriented tools and intuitive features which make for an informative and engaging user experience. Website visitors are provided with the ability to browse or search properties through a series of quick and seamless steps. The website navigation is well-organized, and the page structure and graphical elements employed are kept consistent in order to enhance visitor comprehension. The site structure as represented by the site navigation is an important contributing factor to the general ease of navigation of the website. Navigating the website is easily accomplished with the use of a cleanly designed flash navigation bar, where the user only has to hover over the separate buttons on the bar to quickly access the category of their choice and its relevant sublinks. In this way the website user is able to browse the website, and access the information he or she seeks with minimal effort and relative ease. This feature allows the website visitor to easily search properties on the interactive map with a few quick clicks. The interactive map shows all the properties listed within a particular area, as the user zooms in or out on the map. 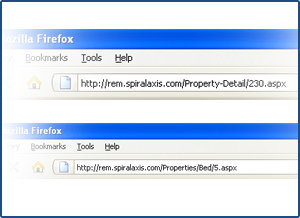 Each property is indicated by a marker, and when the marker is clicked an information box appears which shows relevant details of the property. The map can be viewed in several different ways, as mapped streets, or with satellite imagery that displays satellite images of the property’s location and surrounding community. 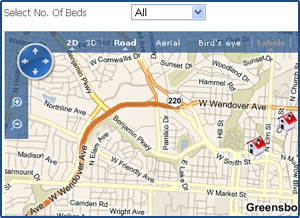 The Interactive Map Search tool offers consumers a new and easy way to find properties of interest. By beginning the search on the map itself, consumers can locate the specific area where they want to search, and discover listings they might not otherwise find when a search is limited to a specific city or zip code. Map Search goes beyond simply showing the results of a search on a map. The location of a property is critical, and consumers want easy access to this information. By seeing an entire area with all listings displayed, consumers can navigate on the map and explore multiple areas at once. This is especially useful for people who are relocating or wanting to live near a specific attraction like a waterfront, park, or commuting hub. This new search tool is a valuable addition to any real estate website. By offering an alternative to a regular form-based search, agents and brokers can create a more compelling online presence. Consumers using the Interactive Map Search will discover interesting properties more quickly and in greater numbers, increasing the likelihood that they’ll contact an agent or broker and become a valuable new customer. Events panel contains dynamic information that can be controlled by website managers through the use of the admin tool. A news heading, brief details, and an image can be added for multiple news items to immediately draw the attention of the website user. Each news item links to a detailed page, where additional information and images can be included. This is a useful area on the home page of the website to add information about current news and upcoming events, and any details website managers would like website users to be immediately aware of. Property listings can be easily accessed by clicking on the relevant type of listings desired, based on the number of bedrooms in this case. The properties are displayed with images, and a summary of clearly defined pertinent details. Relevant information such as address, price etc. 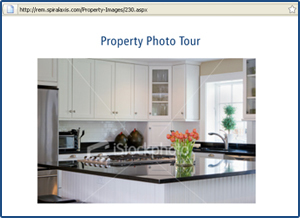 are directly placed next to an image of the property to serve as a brief property profile. Quick links are provided which allow the user to access more details about the property and view the picture gallery, send an email to request more information, or fill out an application to facilitate the user’s overall search and browsing experience. Property listings can be easily managed and edited through the use of the admin area so that the information is easily updated as frequently as required. Each property on the Property Listings page can be clicked to reach its own dedicated property detail page. 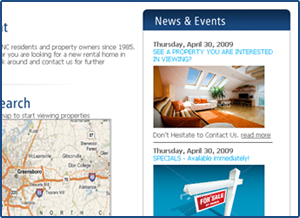 On the property detail page, the website visitor can view further detailed information about each property and its features, as well as view a slide show of the images associated with that property. Images can be updated as frequently as required in a couple of quick and easy steps through the use of the admin area. Each property has an image gallery associated with it. 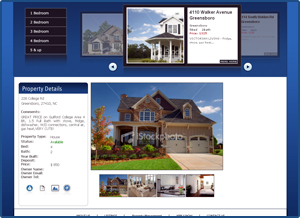 The website user can view a slide show of all the pictures associated with the property they are currently looking at. This allows the user to get a better idea of the property they may be interested in. The manager can add as many images as required for each property. Using a quick upload feature in the admin area, pictures can be added or updated as required. Despite the dynamic nature of the URLs generated for all the pages of the website, a feature which creates search-engine friendly URLs is utilized in order to make your real estate management or rental property management website rank better in search engine searches. Also, these URLs which are more like static html URLs, are always more user friendly and easier to comprehend for the website visitor.